This view from NASA’s Cassini spacecraft was obtained about two days before its first close pass by the outer edges of Saturn’s main rings during its penultimate mission phase. New images from NASA’s Cassini Spacecraft from its new orbit of Saturn. NASA’s Cassini spacecraft has sent to Earth its first views of Saturn’s atmosphere since beginning the latest phase of its mission. 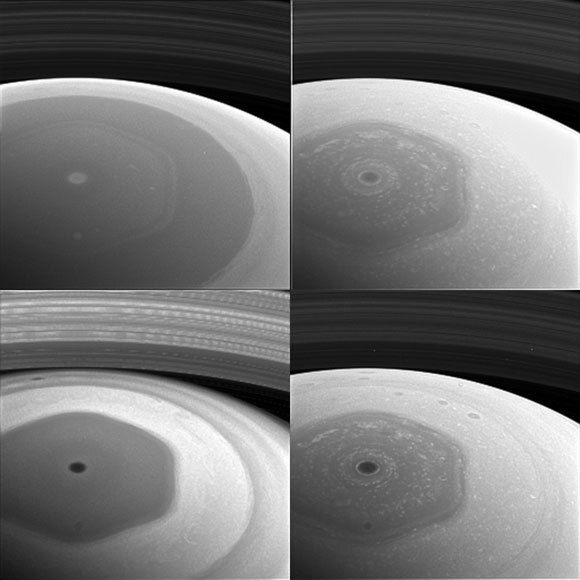 The new images show scenes from high above Saturn’s northern hemisphere, including the planet’s intriguing hexagon-shaped jet stream. Cassini began its new mission phase, called its Ring-Grazing Orbits, on November 30. Each of these weeklong orbits — 20 in all — carries the spacecraft high above Saturn’s northern hemisphere before sending it skimming past the outer edges of the planet’s main rings. 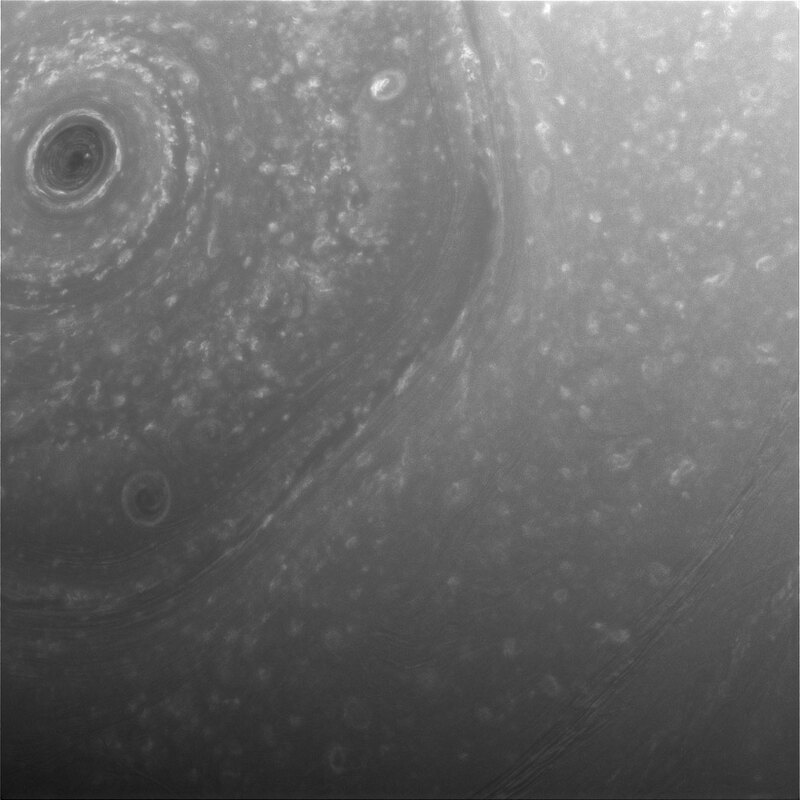 Cassini’s imaging cameras acquired these latest views on December 2 and 3, about two days before the first ring-grazing approach to the planet. Future passes will include images from near closest approach, including some of the closest-ever views of the outer rings and small moons that orbit there. This collage of images from NASA’s Cassini spacecraft shows Saturn’s northern hemisphere and rings as viewed with four different spectral filters. Each filter is sensitive to different wavelengths of light and reveals clouds and hazes at different altitudes. The next pass by the rings’ outer edges is planned for December 11. The ring-grazing orbits will continue until April 22, when the last close flyby of Saturn’s moon Titan will once again reshape Cassini’s flight path. With that encounter, Cassini will begin its Grand Finale, leaping over the rings and making the first of 22 plunges through the 1,500-mile-wide (2,400-kilometer) gap between Saturn and its innermost ring on April 26. On September 15, the mission’s planned conclusion will be a final dive into Saturn’s atmosphere. During its plunge, Cassini will transmit data about the atmosphere’s composition until its signal is lost. Be the first to comment on "NASA’s Cassini Spacecraft Reveals First Images from New Orbit"